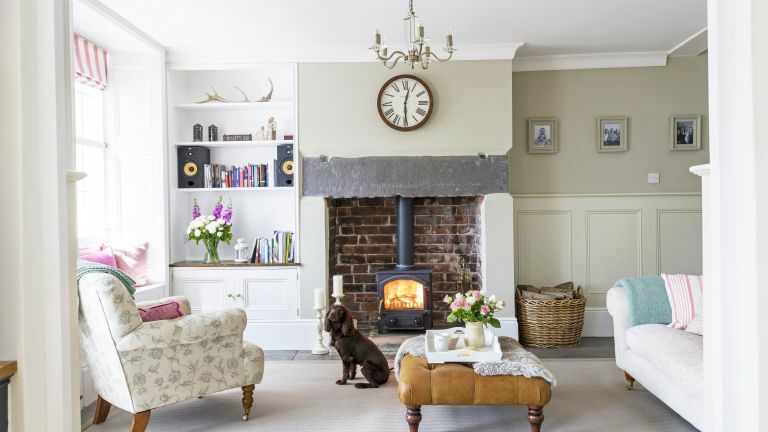 These days, as Rachel and David Ellershaw glance out of their lovingly restored Georgian cottage to see lambs gambolling in the adjacent fields and trees bursting back into life, the couple can’t believe that they didn’t want to even view this property initially. Nearly 18 months on, as the property still languished on the market, Rachel’s mother suggested the pair take a look. ‘David and I have always been fans of Georgian homes and, from the moment we stepped inside, we were enchanted,’ says Rachel. ‘We loved the room proportions and realised there was a wealth of period features waiting to be restored. The exterior was repainted and Rachel’s father helped the couple landscape the garden.‘To enhance the symmetry of the cottage, we laid a cobblestone path, and planted lavender and bay trees,' says Rachel. Luckily, when the Ellershaws made their offer, the vendors were open to negotiation. ‘David and I were already stretching ourselves, but we were desperate to buy,’ Rachel adds. ‘When our first offer was refused, we upped it by £1,000, which was all we could afford.’ This clinched the deal and, in August 2010, the couple were on the move. For the first year, they saved hard and carefully planned their major renovation. Jonny Lawson, of JBL Joinery, rebuilt the conservatory, with help from David. The couple chose Gothic arched windows to further enhance the character of the cottage. The table and chairs are from a local garden centre and the cushion is from Laura Ashley. The skirting is painted in Mole’s Breath and the tongue-and-groove panelling in Purbeck Stone, both Farrow & Ball. In June 2011, the first stage of the project began. ‘Starting at the top, we worked down to give us more time to save for the structural work on the ground floor,’ explains Rachel. The avocado bathroom suite was replaced and the layout reconfigured to include a freestanding bath and shower. ‘The bathroom actually became a sanctuary since our cottage got a lot worse before getting better,’ says Rachel. Exposing the stone lintel and original brick fireplace has created a focal point in the restful living room, and a place for cocker spaniel Bella to enjoy the glow of the fire. Walls are painted in Old White and the panelling in Clunch, both Farrow & Ball. The Alberton armchair, leather footstool and Kingston sofa are all from Laura Ashley and the clock is from Newgate. For a similar stove, try Chesneys. An exposed wooden beam bears the marks of the cottage’s long history. The herringbone rug is from Alternative Flooring, and the sunburst mirror and pendant lights are from Laura Ashley. Rachel’s friend Rachel Thornton did the artwork in the kitchen. The front door is painted in Farrow & Ball’s Mole’s Breath. Lacewing Green crackle glaze tiles, from the Contemporary Classics range by Marlborough Tiles, and a Roman blind in Harvest Hare, in Dawn Grey, by Mark Hearld from St Jude’s, inject extra rural charm into this spacious kitchen. units are from Staley Stonework. ‘We’ve upcycled the dining furniture which used to belong to my parents,’ says Rachel. Once the landing was decorated, it was time to tackle the ground floor. ‘The survey alluded to a solid floor in what was then the dining room,’ says Rachel. ‘We were ecstatic when we lifted the carpet and discovered huge Yorkstone flags underneath. It was a delightful find and high point of the next, rather challenging, phase of work.’ This stage involved knocking down the wall between the cramped galley kitchen and former living room to create a spacious and bright open-plan kitchen-diner. The master bedroom has magnificent views across farmland. Walls are painted in Light Blue, by Farrow & Ball, the curtains are made up in Shalini Linen in Rose by Susie Watson Designs, and the bed is from Laura Ashley. It also required pulling down much of the old lath and plaster ceiling. The wood-burning stove was moved into the inglenook fireplace in the new sitting room, and an Aga was installed in the kitchen. Sash windows were fitted at the front of the cottage and a lean-to conservatory was knocked down. David helped his joiner friend Jonny Lawson to build a new conservatory. ‘It was major work,’ Rachel recalls. A bargain find on Ebay, the pretty bedroom fireplace cost just £16. The chair was sourced from GB Antiques, the cushion is from Susie Watson Designs, and the ceiling light is from Laura Ashley. There’s no doubt that tenacity and hard work have paid huge dividends for this couple, who are justifiably proud of their charming home. ‘Our labour-of-love project has altered the course of our lives completely,’ says Rachel. ‘Apart from owning a home we adore, it has inspired David to launch a property renovation company, Ellershaw Property Renovation. The new-look bathroom is a luxurious retreat, with its tongue-and-groove walls, and a freestanding bath and fittings from Bathstore. The walls are painted in Pointing, and the panelling in Castle Gray, both Farrow & Ball.